Posted March 7, 2016 by Melissa Slive & filed under Blog, Learn How to Prep. Whenever I work with students, I bark at them to have their pencil on the page at all times and to actively cross out incorrect answers. Inevitably, a student barks back at me that he is crossing out and to get off his case. (Sorry boys, it is usually one of you who barks back!) Well, the dainty little slash that he put through the letters “A,” “B,” “C,”…. does not count in my book! In contrast, Caroline’s book had been skewered. She wrote in a slangy, contemporary voice, full of topical, popculture allusions. She wrote about Marilyn Monroe and moo goo gai pan, about alien babies and her strange, loopy obsession with poultry. She was roundly dispatched as a mediocre talent. Most students narrow down the answer choices to A and C, and then pick C because they like the word “allusions,” which comes directly from the text. WRONG! If you were using your pencil to touch each word in the answer choice, you would have noticed the word “puzzled”. Where does it say that Caroline’s allusions puzzled critics? NOWHERE! So you then would have eliminated that choice and picked the correct answer, choice A. 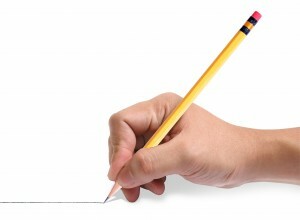 So the next time you are reading, hear the drill sergeant within you yell, “Use your pencil!” and listen!